Twenty pounds - it's like a tune in my head, playing over and over, on a loop. I have set a target to reduce my weight by 20lbs before 5th August. I've made a good start without starving myself and principal among the beneficiaries so far seems to be my knees; they don't ache as much now. It seems to me that there have been several factors which have caused them to ache or swell up intermittently in the past despite a doctor telling me a couple of years ago that "they [my knees] were wearing out". I worked it out that my driving position in the car was the cause that time, so I changed my basic Primera for my much more comfortable Volvo V40 and my knees got better. Last year one knee packed in whilst I was walking home from work. The culprit that time was my office chair or rather my sitting postition in front of the computer. The chair was old, couldn't be adjusted properly and I had made do, ignoring the warning signs. A new chair revived my knees. 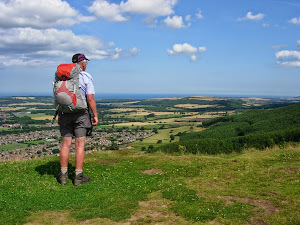 On The Cleveland Way once, with Bryn, on the approach to Saltburn-by-the-Sea, my knees puffed up making it difficult, and painful, to walk. I think the downhill sections across the Yorkshire Moors had done for them on that occasion (I'm hoping that walking poles might alleviate the condition this time round). Recently though I think my knees problem can be attributed to a poor diet which included too much sugar and fat. They are ruled out or strictly limited in my current diet though. That and a slightly more active lifestyle seems to be doing the trick. Twenty pounds is the maximum weight I have set for my fully packed rucksack. I have started to compile a kit list (see link on the right hand side) but I feel that getting the pack below 20lbs isn't going to be easy for me. Bryn and I are going to the Outdoors Show 2009 at the NEC Birmingham this coming weekend. (Ten year old Grandson Rueben is coming with us.) I'll be on the lookout for lightweight items of kit. Lightweight on my back but not on my pocket I suspect, so my £20.00 pocket money won't go far. Weight Watch: 17-23 March -2lbs. Since 9 March -4lbs.